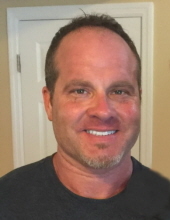 Brent Wolfe Sams, age 43, passed away on November 10, 2018. Brent was born in Georgetown, Kentucky on February 27, 1975 to Betsy Kay Sams and the late Bryan Wolfe Sams. In addition to his mother, he is survived by his son, Jaxon Wolfe Sams, and Rebecca Baker, DMD, mother of Jax. Additional survivors include sister Julie Kay Sams, sister Alícia Sams White (Jonathan), nephew Quinten White and special friend Leanne Morgan. He was a 1997 graduate of Georgetown College with a major in Art. Brent had a special gift in abstract painting and creating stainless steel sculptures. One of his most prominent sculptures, “Extricate”, is a permanent fixture in front of the Georgetown College Art building. His creativity and expert craftsmanship were key assets inherited from his father. These talents were invaluable and allowed him to carry on his father’s legacy through the family business. In addition, he enjoyed working out at the gym, riding motorcycles, and restoring antique cars. Above all, Brent’s greatest joy was spending time with Jax. To send flowers or a remembrance gift to the family of Brent Wolfe Sams, please visit our Tribute Store. "Email Address" would like to share the life celebration of Brent Wolfe Sams. Click on the "link" to go to share a favorite memory or leave a condolence message for the family.